Ever since she was a child, Ashley Keene knew she wanted to be an artist. Since then, she knew it was ingrained in her to be an artist. And now, at 31 years old, she’s made art her career. 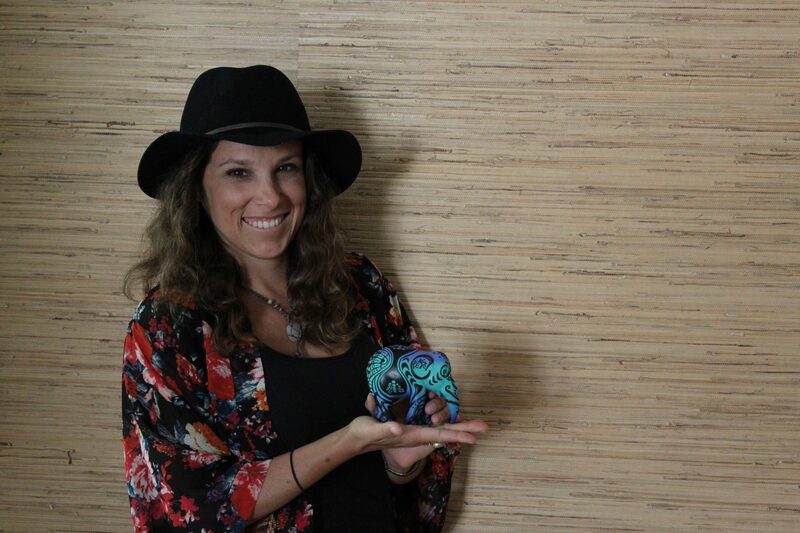 Keene’s work has been seen in Dana Point during the Elephant Parade, on one of the kickball walls at R.H. Dana Elementary School, on a utility box in San Clemente and on public art banners in Laguna Beach. She’s had showcases, and has been a part of art walks and shows. In 2013, when the life-size elephant statues came to Dana Point, Keene said it was a special moment to produce art in the project. She said she was able to work with kids on painting miniature versions of the elephants and was extremely pleased when her statue sold. “A good amount of money went to Asian elephants; I was really proud of that,” Keene said. Last year, Keene submitted her work for R.H. Dana Elementary School’s 50th anniversary. Today, though Keene has moved to San Clemente, her mural still stands brightly on the kickball wall on the school’s blacktop with a design of whales and other marine life swimming, a tall ship in the background with the iconic bluffs. Keene said she enjoys doing public art pieces and feels it’s part of her duty as an artist. Currently, Keene works freelancing gigs and works on different pieces on commission. Using recycled materials is important to Keene and growing up in Dana Point only cemented that philosophy. “I think people are always breaking boards and trashing them, and they can be utilized still. I want to help preserve the area, and I’m always looking to do that in an art form,” Keene said. The surfboard artwork began when she was interning at Lost Surfboards in San Clemente. She said her boss showed her videos of how to paint on the boards and from there, it stuck. The iconic beaches have inspired her, and many Dana Point locals would recognize her scenic pieces. Along with Strands Beach, her most recent piece showcases Killer Dana. Keene said some of her other inspirations come from her annual trips to Yosemite with her family and everyday life. When asked what her favorite piece of artwork was, she said it’s usually her most current piece. She said she works on making each piece better than the last and wants to continue to grow. Lately, Keene said she hasn’t been showcasing her work as much because she’s focusing on creating more pieces. Keene will be one of the artists at the Dana Point ArtFest on May 21, which runs along Del Prado. To see her work, visit www.shleeart.net.